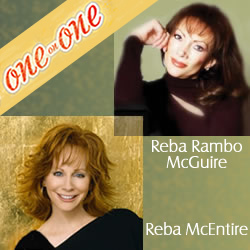 REBA RAMBO McGUIRE: First of all, how funny doing “Reba to Reba”? Thus the obvious first question—how’d you get your name? REBA McENTIRE: That’s my mother’s mother’s name. Her name was Reber Estelle Brasfield Smith, and she didn’t like Reber so she changed it to Reba. RRM: I started laughing when I learned your middle name was Nell. When I was 14 and we first moved to Nashville, Duane Allen of the Oaks came over to help us. He started calling me Reba Nell and so did William Lee Golden—they have ever since..
REBA: What’s your middle name? RRM: Faye. I have both my parents’ real middle names—Buck and Dottie are both nicknames. OK—I know our Homecoming friends are curious to know, was there anyone who influenced you musically early on? REBA: You! And, of course, your momma and daddy—the Singing Rambos. We listened to ’em religiously. There was this beautiful three-part harmony, and my older brother Pake, my younger sister Susie and me, that’s what WE did. We were the Singing McEntires! RRM: The Singing McEntires and the Singing Rambos—how funny! REBA: Yep, and we wore y’all’s records out! RRM: But tell me, who else influenced you in your formative years? 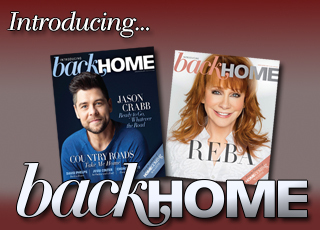 REBA: A lot of country artists, but in the gospel world it was basically you guys. And then, of course, Loretta Lynn had a gospel album, and I grew up with that influence. Every noontime, right when we broke for lunch at Grandma and Grandpa’s house, I heard… (singing) “Give the world a smiling face, smiling face!” Every day at noon, everything stopped moving for gospel music in the house! RRM: Were you a church-going kind of young girl or were you just raised with a spiritual influence? REBA: Both. Because of my Grandma Reba, my momma’s momma, they were church goers. Mama said Grandma Reba and Grandpa Elvin met in a little Baptist church in Bethel, Oklahoma. Grandma’s name was later taken off the membership because she acted in an “ungodly manner” by speaking in tongues. They moved over to the Assembly of God church in Kiowa, Oklahoma. RRM: So, were you raised strict with lots of rules? REBA: No, not religious rules. Back then, my mother was so rebellious about having to go to church all the time. You know “the best piece of chicken went to the preacher” stuff. Everybody was so religious that she went totally the opposite. When she got married, she didn’t make us kids go to church, and she didn’t go. She didn’t have a garden. She didn’t have any chickens. Basically, everything Grandma and Grandpa had, she didn’t. But my little sister Susie, my older sister Alice and I all went to church. We were all baptized. It’s funny ’cause people would ask me, “How long have you known the Lord?” And I said, “Don’t you always know the Lord?” So, it was just a sure thing for me. I would go to the pond with Grandma, and we’d go fishin’ all day and she’d tell us amazing Bible stories and the miracles of Jesus. So for all my life, I’ve just always had the Lord in my heart. RRM: To me, being on a creek bank or by the ocean, that’s about the closest to God I’ve ever been. OR that’s where He talks louder or I’m listening better. RRM: Was your grandmother your greatest spiritual influence? REBA: By far…and now my mother-in-law and my father-in-law. They’re very spiritual people. Good examples. They live by example. That’s what Grandma did. RRM: I have a real touch with the earth and believe the earth is the Lord’s. I was reading about you growing up on a huge ranch. What was that like? REBA: I loved it. It was about an 8,000-acre ranch. I’d get home from school, change clothes and run to the barn. And then I’d go get my horse and ride him for another hour. I love being outside. So I didn’t know how to cook, didn’t wash clothes, didn’t do any of the housekeeping unless I was made to. We were always out with Daddy working cattle. RRM: I was interested when I was reading about your schooling and saw instead of a high-school band your school had a country music band. I just thought that was a hoot! REBA: You know, Jeannie Shepherd did the same thing! My mother (who also loves to sing) was secretary to the school superintendent. And my Oklahoma history and art teacher, Clark Rhyne, was a singer and musician. We didn’t have a marching band or a choir; nothing like that. So Mama and Clark got together and he said, “You know we got quite a few kids here who are musically talented. Let’s put a little band together!” They did and made it into a class, and we learned so much..
RRM: Do you ever feel as if all of that was God setting you up for who He wanted you to be? Sometimes I think God starts at the end and works backwards. REBA: Wow. I never thought of that. I know it was a great plan. He had it all down pat. That’s why when people say, “What are you gonna do next?”—I don’t have a clue. Never have. And my husband Narvel and I are on the same page. We’ll try something and if it doesn’t work, back off. It’s not the plan. And we’ll sit and we’ll wait. We’ll LISTEN. And we know that when God’s ready for us to do something, He lays it all out for us and it just falls into place; the smoothest you could imagine. You gotta be quiet and listen. RRM: I know you’ve co-written a few very wonderful songs. But because you choose GREAT songs and you have from the time you were allowed to choose them, I’ve always thought you had the potential to write a lot and be an absolutely amazing writer. RRM: And you know what was amazing as I watched you that night? The joy that was on your face! And I know it was hard, but you had that great cloud of witnesses cheering you on! REBA: They were there that night with me. You know, I call ’em my Happy Helpers. Because I know there are angels, but I think there’s more. RRM: When there’s a challenge, do you ever have a song that’s been like a secret place you run to? REBA: “How Great Thou Art.” Yeah, that’s mine. Every time we get together, especially Thanksgiving, Susie breaks out (singing) “Then sings my soul, my Savior God to Thee!” I don’t know why—if it’s the three-part harmony or the great feeling it brings — but we’re all choked up! RRM: What do you feel is your most important life assignment? REBA: To listen. Anybody can talk. And the position I’m in, I have to talk a lot. But when people are having problems, I’ve realized they don’t need advice. They don’t need anything except for me to sit there and listen, because God’s working. And I’m also an interpreter of songs. If a song touches my heart, I sing it. Hopefully, it’s gonna touch your heart if I do my job right and live by example. RRM: Some of my favorite things I’ve seen you do are your duets. REBA: Thanks. I love duets—in singing, in acting, in skits. RRM: I got a kick out of you singing with Andrea Bocelli. Classic Opera meets Grand Ole Opry — in theory it doesn’t seem like it would work, but boy did it! REBA: And intimidating! But you can’t do what he does. He can’t do what you do. You do what you do and you go with it. So we did. David Foster is the genius that put that together. RRM: Let’s talk about Narvel and you. It’s amazing you can do what you do working together with him as your manager. REBA: We love what we do. We respect each other and, of course, love is a given thing. You can live with a person if you don’t love them, but still respect them. When the respect is gone, it’s over. But with Narvel, I love and respect him. He’s my best friend. He’s my buddy. When I think of a place I want to go, like Bora Bora, my favorite place in the world, I want Narvel with me because we have a great time working and playing. RRM: Your latest album, All The Women I Am, which I happen to love, was produced by Dann Huff. When I saw his name on the credits, I got such a giggle because his dad, the wonderful arranger Ronn Huff, used to work so much with Dony and me. REBA: Really? I didn’t know that he did arrangements for you! RRM: Yes. When Dann was just a kid and starting to play guitar, Dony started using him on some little demos to give him some practical experience in the studio! Dann has grown into a phenomenal talent! REBA: I just got through cutting “I’ll Be Home For Christmas” today with Dann producing. I cried through the whole thing. RRM: OK, I’m gonna throw just a few quick questions at you. What’s your favorite comfort food? REBA: That’s hard. Mmmm. Probably beans and cornbread, fried potatoes and sweet tea! REBA: “I’m gonna have to take more time on the next one!” (laughter) He left out a few things! RRM: No, He made you perfect for His pleasure. I promise you. REBA: Aw. I agree with you. I think He’s gotten a lot of chuckles out of me and kind of scratched His head a couple times and had to thump me on the head a few times to get me back on the right path. But, boy I sure do appreciate it! RRM: Do you ever feel overwhelmed that you have such a God-given gift to simply open your mouth and sing? REBA: Oh, yeah. And my heart aches for people who don’t know what they want to do in life. Because all my life, I knew I could sing, but what I really wanted to be was a professional barrel racer in the rodeo. I was born and raised on a horse. And then I wouldn’t win. I won just enough to have fun with it. And Daddy said, “Reba, why do you always wanna do something you’re not good at?” And I’m like, “Oh, that was hurtful! Ouch. Well, what do you mean?” He said, “Your voice. You’ve got a God-given voice. Work on that.” And he was right. RRM: If you could start all over again, what would you change? REBA: I would be me. I would be the goofy, silly, “say what I think when I think it” me, instead of being so guarded and trying to be something I’m not. I was always experimenting with my voice, trying more trills. I always thought more was better. And I just got through doing this Christmas song, and I sang it so straight. The more straight I sang it, the more emotional I got, and I’d just have to stop. That’s the greatest advice I can give to anybody trying to come up the ladder. Just be yourself. And thank goodness, I never lost my accent. I can’t even imitate somebody with a good accent. But, you know, that got me a long way in this world. I wouldn’t change it for nothin’. RRM: If you were a song, what kind would you be? 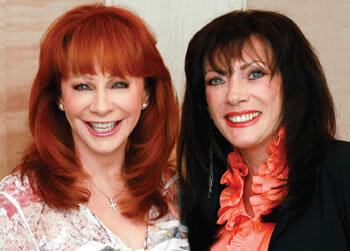 REBA: An up-tempo, four-four two-stepper… with a tag…in three-part harmony. RRM: What do you want on your tombstone? RRM: …who had lots of Happy Helpers! RRM: Because heaven exists, what would you like to hear God say when you arrive? REBA: “You thought earth was good—this is even better!” Because, oh my, has this life been good for me . . .really, really good!